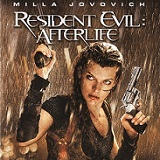 After a one-woman assault on the Umbrella Corporation’s fortress, Alice’s (Milla Jovovich) superhuman abilities are neutralized. 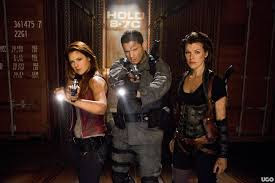 Now, fleeing the Undead masses created by the T-virus, Alice reunites with Claire Redfield (Ali Larter) and her brother, Chris (Wentworth Miller). Together they take refuge with other survivors in an abandoned prison, where a savage zombie mob stands between them and the safety of "Arcadia." Escaping these bloodthirsty mutants will take an arsenal. But facing off with Albert Wesker and the Umbrella Corporation will take the fight for survival to a new level of danger. 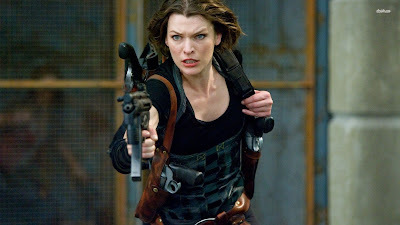 Based on the popular Resident Evil video games, the films follow Alice (Mila Jovovich) through her war with the undead. Alice was once an employee of the Umbrella Corporation. She discovered that they had created a deadly virus and hoped to stop them. The T-Virus was unleashed, creating a rapidly spreading population of zombies. Alice was infected with the T-Virus, but it bonded with her giving her super strength and speed. The Umbrella Corporation was very interested in capturing and studying Alice, which did not end well for them. 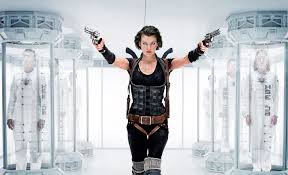 Resident Evil: Afterlife begins in Japan. The Umbrella Corporation operates from an underground facility, and the surface has been overtaken by zombies. Alice makes her way through the Umbrella sight killing security guards as they come at her. She is no longer concerned with where the individual falls on the Umbrella Corporation food chain. I assume that every Umbrella Corporation hire begins with a training video, explaining that you are in fact a part of an evil organization. A familiar face, Albert Wesker (Shawn Roberts) has been hunting Alice. She catches up to him in Japan but he is able to inject her with an agent that destroys the T-Virus in her system. This leaves Alice without her super powers (strength, healing, and speed) but she still survives incredible odds. Alice hops in a plane and heads for Alaska. In Resident Evil: Extinction, Alice sent a group of friends to Alaska, in search of a town called Arcadia. Arcadia was rumored to be a sanctuary, free from infection. When Alice arrives in Arcadia she finds only one member of her group, Claire Redfield (Ali Larter). Claire has amnesia and has been controlled by an Umbrella Corporation device. Like a good friend would, Alice ties Claire up and drags her to the plane. The two women are back in the air, headed for what remains of southern California. Alice manages a remarkable landing on top of a prison. She meets a group of survivors, including basketball player Luther West (Boris Kodjoe) and Claire's brother Chris (Wentworth Miller). The prison is threatened by the braindead zombies banging on the doors. Additionally, there is a mega zombie that will certainly break through the gates and another creature making its way through the foundation. Nearby a ship, The Arcadia, sits motionless. At this point Alice learns the Arcadia is not a town in Alaska, but it is a massive ship that still shows promise. She hopes to bring her new friends and find the old ones happy and healthy on board the ship. The Resident Evil franchise is one of my favorites. Its gory, it’s bloody and not particularly inventive. The fourth movie is much like the third, and the second, and so on. That’s not a bad thing. More of the same is okay with me. I enjoy following Alice on her adventures and refuse to devote any brain power to the impossibility of her situations. This film was just as enjoyable as any prior Resident Evil film or the one that followed. This is one of my favorites of the franchise and I can’t honestly put my finger on why that is. These films are not stand-alones, which is one of the things I like most about them. I appreciate the running story line and have enjoyed following Alice through zombie land. This film was made for a 3D audience and much of the actions comes directly at the viewer. I’m not a fan of watching 3D movies at home, and I prefer the UHD format. I certainly don’t feel like I’m missing anything by watching it in 2D and I’m happy to report that the action planned for 3D doesn’t come off as gimmicky tricks that ruin the movie in 2D. Resident Evil: The Final Chapter is due to be released in theaters this Friday. The Final Chapter is the sixth movie in the franchise, so don’t forget to watch Resident Evil: Retribution before heading to the theaters. Resident Evil: Afterlife’s 4K UHD release offers significant improvements over the standard Blu-ray release. The HDR colors are muted, but it works very well for this dreary film. Much of the film is stark white or deep black and the UHD release handles both extremes well. Detail inside the plane shows marked improvements. This is the situation where you’d never know what you were missing until you compared the two formats. Skin and clothing textures and the details of the zombie hoards show increased definition. Water falls in very cool ways. Mila’s makeup is a bit too fresh from a storytelling standpoint but those details are only evident because of the quality of the UHD release. Resident Evil: Afterlife's UHD release includes a Dolby Atmos soundtrack which is an upgrade from the previous DTS-HD Master Audio 5.1 presentation. Gun fire is the predominant effect, which is authentic and offers directionality. The opening offers a chance to hear Alice swoop in for the kill. You can hear the echoes in the large umbrella facility and feel the claustrophobia of the small spaces in the prison. Dialogue is even and intelligible throughout the film. This is a well-rounded, prioritized and executed presentation from Sony. 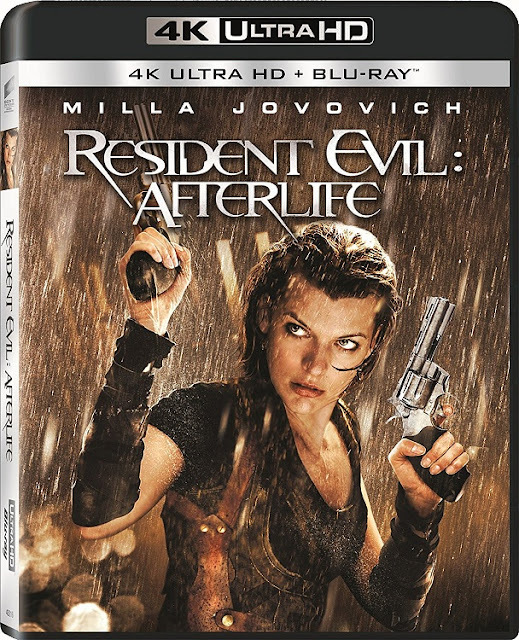 Resident Evil: Afterlife's UHD release includes the Blu-ray with all of the supplemental content previously released. Movie IQ is available for an additional viewing experience. The UHD disc contains cast and crew stills with a Moments collection. Undead Vision: Picture-in-Picture - This option adds cast and crew interviews along with previsualization artwork and behind the scenes footage. The window is very small so it doesn’t take up too much of the screen, but it also makes it hard to see details. Audio Commentary - Writer/Director Paul W.S. Anderson and Producers Jeremy Bolt and Robert Kulzer provide the standard commentary with interesting information about shooting in 3D, special effects, stunts and more. You won’t learn anything remarkable but fans interested in the filmmaking process should enjoy the insights. Deleted & Extended Scenes – Just under seven minutes of deleted and extended scenes including Intruders-Extended, Alice and Claire in the Plane, Alice Rolls Quarters -- Extended, Getting Dirty, Crystal Volunteers, On the L.A. River, and To Arcadia -- Extended. Outtakes – 4 ½ minutes of bloopers and fun moments on set. It’s unusual to see Alice smiling and laughing which makes the lighter times worth taking note. Back Under the Umbrella: Directing Afterlife – A look at Anderson’s work throughout the series and Alice’s character. Band of Survivors: Casting Afterlife – A featurette focused on the primary cast and characters. Undead Dimension: Resident Evil in 3D – The challenges and rewards of a 3D shoot. Fighting Back: The Action of Afterlife – A brief look at the stunt work and the physicality of the film. Vision of the Apocalypse: The Design of Afterlife – Storyboard, previsualization and set design are explored in this featurette. New Blood: The Undead of Afterlife – A look at the zombies and what it takes to make them real. Pwing the Undead: Gamers of the Afterlife – The cast and crew discuss the game and its similarities to the film. Sneak Peek of Resident Evil: Damnation – A peek at the sequel to the anime film Resident Evil: Degeneration. Resident Evil: Afterlife's UHD release doesn't add any new supplemental features, which is okay because the Blu-ray release bordered on overkill. The UHD release offers a noticeable audio and video upgrade from the standard Blu-ray. I highly recommend the film and the purchase to anyone who has loved other films in the franchise.